Dr. Thomas C. Barone, a family physician, practiced in Center City until the State Board of Osteopathic Medicine suspended his license after four current and former patients died of opioid overdoses. Photo taken following his testimony at a reinstatement hearing in Harrisburg on Sept. 16, 2016. 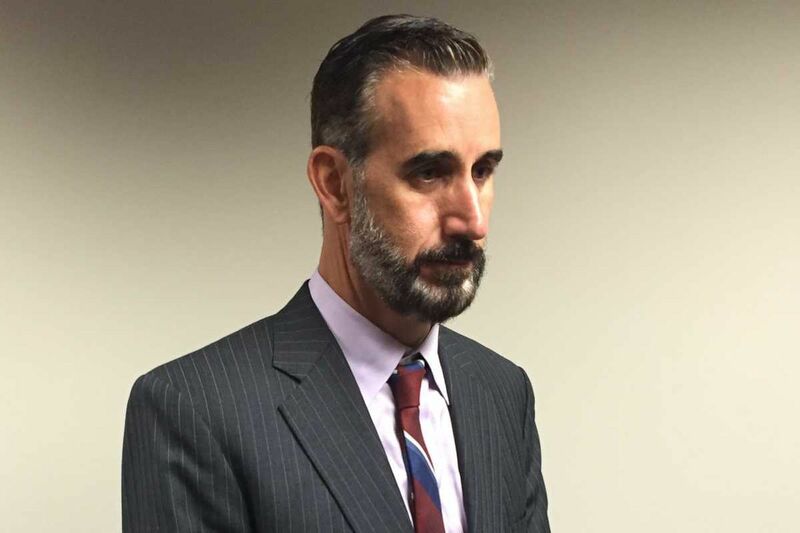 The Pennsylvania Board of Osteopathic Medicine refused Wednesday to let Thomas C. Barone, a pain management physician whose prescribing practices were linked to the deaths of four patients, return to his Center City practice. The decision continues a license suspension that began two years ago, after investigators accused Barone of inappropriately prescribing tens of thousands of pills, most of them highly addictive opioid painkillers, to four patients who later died of overdoses, one of them due to heroin. The medical board gave no reason for its decision, which will be followed by a written order. But a hearing examiner had recommended after a September hearing that Barone's reinstatement petition be denied. She said that while Barone had completed a required training and skills assessment program, he did not follow up on 10 recommendations that the program had made. Among them was enrollment in a medical ethics course at Rutgers University after he scored in the lowest percentile on an ethics assessment. Barone testified at the hearing that he believed the recommendations were unnecessary and not cost-effective. Reached on Wednesday, Barone said only that he did not know whether he would reapply for his medical license. No criminal charges have been brought against Barone. Prosecutors pursue criminal counts involving prescribing practices only in extraordinary cases. A federal jury in Philadelphia last week convicted Jeffrey Bado, who formerly practiced in Roxborough and Bryn Mawr, on 308 counts, including 269 of drug distribution and one of drug distribution resulting in death. In October, pill mill kingpin William J. O'Brien III was sentenced in federal court to 30 years in prison on 123 counts involving money laundering and drug trafficking, in an operation that included prostitutes and the Pagans motorcycle gang. Joe Caltagirone said Wednesday that he hopes prosecutors are investigating Barone as well. His 39-year-old son, Joey, died in May 2014 after what an expert witness at Barone's license-suspension hearing several months later described as a "blatantly hazardous" methadone prescription whose deadly outcome was "predictable." According to a civil lawsuit against Barone filed by lawyer Richard J. Hollawell of Marlton, the doctor had already prescribed 13,965 Percocets, 10,622 OxyContins, and 3,267 Xanax, among others. Three months ago, Hollawell filed another suit alleging that sales representatives for a subsidiary of Teva Pharmaceuticals, the giant drugmaker with North American headquarters in North Wales, Montgomery County, had illegally marketed a type of fentanyl to Barone, who prescribed it to Caltagirone. Fentanyl is a powerful synthetic opioid that is available in both pharmaceutical and illicit forms. Street fentanyl is increasingly being used to cut heroin and is a suspect in 35 overdose deaths this month in Philadelphia. Pharmaceutical fentanyl often is improperly prescribed, according to critics. Barone's records show that he prescribed 5,918 of the highly addictive Actiq brand fentanyl lollipops to Caltagirone between 2005 and 2011.